Prayer recited in the synagogue at the beginning of the evening service on the Day of Atonement; the name is taken from the opening words. The "Kol Nidre" has had a very eventful history, both in itself and in its influence on the legal status of the Jews. Introduced into the liturgy despite the opposition of rabbinic authorities, repeatedly attacked in the course of time by many halakists, and in the nineteenth century expunged from the prayer-book by many communities of western Europe, it has often been employed by Christians to support their assertion that the oath of a Jew can not be trusted. "All vows [ ], obligations, oaths, and anathemas, whether called 'ḳonam,' 'ḳonas,' or by any other name, which we may vow, or swear, or pledge, or whereby we may be bound, from this Day of Atonement until the next (whose happy coming we await), we do repent. May they be deemed absolved, forgiven, annulled, and void, and made of no effect; they shall not bind us nor have power over us. The vows shall not be reckoned vows; the obligations shall not be obligatory; nor the oaths be oaths." "And it shall be forgiven all the congregation of the children of Israel, and the stranger that sojourneth among them, seeing all the people were in ignorance"
This also is repeated three times. The ḥazzan then closes with the benediction, : "Blessed art thou, O Lord our God, King of the Universe, who hast preserved us and hast brought us to enjoy this season." In many congregations Num. xiv. 19-20 is recited before this benediction. After it the Torah-scrolls are replaced, and the customary evening service begins. The tendency to make vows was so strong in ancient Israel that the Pentateuchal code found it necessary to protest against the excessive estimate of the religious value of such obligations (Deut. xxiii. 23). Rash and frequent vows inevitably involved in difficulties many who had made them, and thus evoked an earnest desire for dispensation from such responsibilities. This gave rise to the rite of absolution from a vow ("hattarat nedarim") which might be performed only by a scholar ("talmid ḥakam"), or an expert ("mumḥeh") on the one hand, or by a board of three laymen on the other. On account of the passionate nature of the Jews and of Orientals in general, however, and in view of their addiction to making vows, it might easily happen that these obligations would afterward be wholly forgotten and either not be kept or be violated unintentionally (see L. Löw, "Die Dispensation von Gelöbnissen," in "Gesammelte Schriften," iii. 361 et seq.). The religious consciousness, which felt oppressed at the thought of the non-fulfilment of its solemn vows, accordingly devised a general and comprehensive formula of dispensation which was repeated by the ḥazzan in the name of the assembled congregation at the beginning of the fast of Atonement. This declared that the petitioners, whowere seeking reconciliation with God, solemnly retracted in His presence all vows and oaths which they had taken during the period intervening between the previous Day of Atonement and the present one, and made them null and void from the beginning, entreating in their stead pardon and forgiveness from the Heavenly Father. This is in accordance with the older text of the formula as it is preserved in the "Siddur" of Amram Gaon (ed. Warsaw, i. 47a) and in the "Liḳḳuṭe ha-Pardes" (p. 12b). The "Kol Nidre" was thus evidently developed from the longing for a clear conscience on the part of those seeking reconciliation with God. The date of the composition of the prayer and its author are alike unknown; but it was in existence at the geonic period. The readiness with which vows were made and the facility with which they were annulled by the scribes gave the Karaites an opportunity to attack the Rabbinites, and forced the Geonim to minimize the power of dispensation. Yehudai Gaon of Sura (760), author of the "Halakot Pesuḳot," went so far as to forbid any study whatsoever of Nedarim, the Talmudic treatise on oaths (Alfasi on Nedarim, end; L. Löw, l.c. p. 363). Thus the "Kol Nidre" was discredited in both of the Babylonian academies and was not accepted by them (S. K. Stern, in "Ḳebuẓat Ḥakamim," ed. Warnheim, 1861), as is affirmed by the geonim Naṭronai (853-856) and Hai Bar Naḥshon (889-896; Müller, "Mafteaḥ," p. 103; Cassel, "Teshubot Geonim Ḳadmonim," p. 9; Zunz, "Ritus," p. 189; Ṭur Oraḥ Ḥayyim, § 619; "Kol Bo," § 68). Amram Gaon in his "Siddur" (l.c.) calls the custom of reciting the "Kol Nidre" a foolish one ("minhag sheṭut"). According to Naṭronai, however, it was customary to recite the formula in various lands of the Jewish dispersion, and it is clear likewise from Amram's "Siddur" (ii. 37a) that the usage was wide-spread as early as his time in Spain. But the geonic practise of not reciting the "Kol Nidre" was long prevalent; it has never been adopted in the Catalonian or in the Algerian ritual (Zunz, l.c. p. 106); and there were always many congregations in lands where the Provençal and Spanish ritual was used which did not recite it ("Orḥot Ḥayyim," p. 105d; comp. also RaN to Ned. 23b, where it is said: "There are some congregations which usually recite the 'Kol Nidre' on the Day of Atonement"). Together with the "Kol Nidre" another custom was developed, which is traced to Meïr of Rothenburg (d. 1293; "Orḥot Ḥayyim," p. 106b). This is the recital before the "Kol Nidre" of the formula mentioned beginning "Bi-yeshibah shel ma'alah," which has been translated above, and which gives permission to transgressors of the Law or to those under a ban ("'abaryanim") "to pray with the congregation" (ib. ; "Kol Bo," § 68, end), or, according to another version which is now generally prevalent, to the congregation "to pray with the transgressors of the Law." To justify prayer on that day with such transgressors and with persons under a ban, a haggadic saying (Ker. 6b) was quoted to the effect that a fast-day was to be counted as lost unless "the wicked" were present (see Maḥzor Vitry, ed. Hurwitz, p. 381; Zunz, l.c. p. 96). From Germany (Ṭur Oraḥ Ḥayyim, § 619) this custom spread to southern France, Spain, Greece, and probably to northern France, and was in time generally adopted (Shulḥan 'Aruk, Yoreh De'ah, 619, 1; Zunz, l.c. p. 96). The assertion that the "Kol Nidre" was introduced on account of the Spanish Maranos (Mandelstamm [anon. ], "Horæ Talmudicæ," vol. ii. ; "Reform in Judenthum," pp. 7 et seq., Berlin; comp. also "Ha-Ẓefirah," 1885, p. 361; Liebersohn, in "Ha-Meliẓ," 1868, p. 270) is incorrect, although the formula may have been used in Spain with reference to them. An important alteration in the wording of the "Kol Nidre" was made by Rashi's son-in-law, Meïr ben Samuel, who changed the original phrase "from the last Day of Atonement until this one" to "from this Day of Atonement until the next." Thus the dispensation of the "Kol Nidre" was not as formerly a posteriori and concerned with unfulfilled obligations of the past year, but a priori and having reference to vows which one might not be able to fulfil or might forget to observe during the ensuing year. Meïr ben Samuel likewise added the words "we do repent of them all" ( ), since, according to the Law, real repentance is a condition of dispensation. The reasons assigned for this change were that an "ex post facto" annulment of a vow was meaningless, and that, furthermore, no one might grant to himself a dispensation, which might be given only by a board of three laymen or by a competent judge ("mumḥeh"). Meïr ben Samuel cited further, in support of his arguments, Ned. 23b, which reads: "Whoever wishes all the vows he may make throughout the year to be null and void shall come at the beginning of the year and say: 'May all the vows which I shall vow be annulled.'" This change made by Meïr ben Samuel is given by Rabbenu Tam in his "Sefer ha-Yashar" (ed. Venice, 1816, § 144), although it did not emanate from him, as the old authorities incorrectly supposed (e.g., Isaac ben Moses of Vienna, "Or Zarua'," p. 126b; Aaron ha-Kohen of Lunel, "Orḥot Ḥayyim," p. 106b; RoSH to Ned. 23b and Ṭur Oraḥ Ḥayyim, § 619). It appears to have been Rabbenu Tam, however, who accounted for the alteration made by his father as already stated, and who also tried to change the perfects of the text, "which we have vowed," "have sworn," etc., to imperfects. Whether the old text was already too deeply rooted, or whether Rabbenu Tam did not correct these verbal forms consistently and grammatically, the old perfects are still retained at the beginning of the formula, although a future meaning is given to them. There has been much discussion concerning the correct reading of the formula as affecting the tenses, yet even men like Jacob Emden (see "She'elat Yabeẓ," i., No. 135) and Wolf Heidenheim (introduction to the Maḥzor, ed. Hanover, 1837) did not venture to introduce the change into the Maḥzor. Mordecai Jaffe, author of the "Lebushim,"states that he often tried to teach the ḥazzanim a more correct form of the "Kol Nidre," but that as often as they recited it in the synagogue they lapsed into the old text to which the melody of the hymn had accustomed them (Heidenheim, l.c.). The alteration made by Meïr ben Samuel, which agreed with Isaac ibn Ghayyat's view (see Isaac ben Sheshet, Responsa, No. 394, end), was accepted in the German, northern French, and Polish rituals and in those dependent on them, but not in the Spanish, Roman, and Provençal rituals (see Zunz, "Die Ritus von Avignon," in "Allg. Zeit. des Jud." 1838, p. 303). The old version is, therefore, usually called the "Sephardic." The old and the new versions are sometimes found side by side (see Maḥzor of Aragon, Salonica, 1805). The change was bitterly opposed, especially by the Italian Isaiah di Trani (in 1250), since the old text was known to all and was in every Maḥzor ("Tanya," ed. Cremona, 1565, p. 102b), and even in the places which adopted the alteration there were always authorities who preferred the old reading and rejected the new, such as Jacob Landau ("Agur," ed. Sedilkow, 1834, p. 73b). It should be noted, furthermore, in regard to the text of the "Kol Nidre," that in the "Siddur" of Amram (l.c.) and in the Roman Maḥzor (Zunz, "Ritus," p. 96) it is wholly in Hebrew, and therefore begins "Kol Nedarim" (comp. 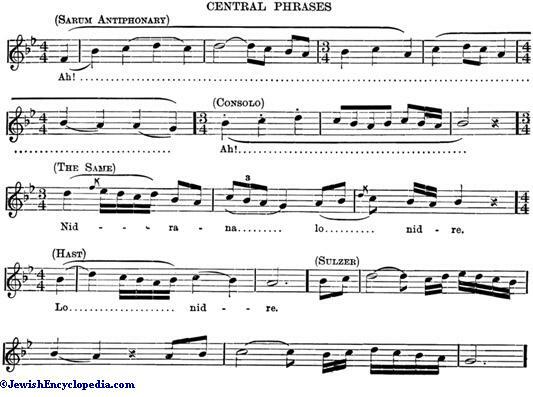 also "Liḳḳuṭe ha-Pardes," l.c.). The determination of the time in both versions is Hebrew. The words "as it is written in the teachings of Moses, thy servant," which were said in the old form before Num. xv. 26, were canceled by Meïr of Rothenburg (Abudarham, p. 75b). In many places the "Kol Nidre" was recited once only (see Rabbenu Tam, l.c. ); in others, twice, so that late comers might hear it ("Liḳḳuṭe ha-Pardes," p. 12b); in some congregations, however, it was said three times. This last usage is justified by Rabbenu Tam on the ground that there are many rabbinical formulas which are repeated thrice, such as "Ḥaluẓ ha-Na'al" in the "Ḥaliẓah" or "Muttar Lak" ("May it be permitted thee") in the absolution from a vow. As to the manner in which the ḥazzan is to recite the "Kol Nidre," the Maḥzor Vitry (p. 388) gives the following directions: "The first time he must utter it very softly like one who hesitates to enter the palace of the king to ask a gift of him whom he fears to approach; the second time he may speak somewhat louder; and the third time more loudly still, as one who is accustomed to dwell at court and to approach his sovereign as a friend." The number of Torah-scrolls taken out for the "Kol Nidre" varied greatly according to the different "minhagim." In some places it was one; in others, two, three, seven, or even all (see "Ḥayye Abraham," p. 47a, Leghorn, 1861). The first Torah-scroll taken out is called the "Sefer Kol Nidre." The "Kol Nidre" should be recited before sunset, since dispensation from a vow may not be granted on the Sabbath or on a feast-day, unless the vow refers to one of these days. The "Kol Nidre" has been one of the means widely used by Jewish apostates and by enemies of the Jews to cast suspicion on the trustworthiness of an oath taken by a Jew (Wagenseil, "Tela Ignea, Disputatio R. Jechielis," p. 23; Eisenmenger, "Entdecktes Judenthum," vol. ii., ch. ix., pp. 489 et seq., Königsberg, 1711; Bodenschatz, "Kirchliche Verfassung der Heutigen Juden," part ii., ch. v., § 10, Frankfort and Leipsic, 1748; Rohling, "Der Talmudjude," pp. 80 et seq., Münster, 1877); so that many legislators considered it necessary to have a special form of oath administered to Jews ("Jew's oath"), and many judges refused to allow them to take a supplementary oath, basing their objections chiefly on this prayer (Zunz, "G. S." ii. 244; comp. pp. 246, 251). As early as 1240 Jehiel of Paris was obliged to defend the "Kol Nidre" against these charges. It can not be denied that, according to the usual wording of the formula, an unscrupulous man might think that it offers a means of escape from the obligations and promises which he had assumed and made in regard to others. The teachers of the synagogues, however, have never failed to point out to their cobelievers that the dispensation from vows in the "Kol Nidre" refers only to those which an individual voluntarily assumes for himself alone (see RoSH to Ned. 23b) and in which no other persons or their interests are involved. In other words, the formula is restricted to those vows which concern only the relation of man to his conscience or to his Heavenly Judge (see especially Tos. to Ned. 23b). In the opinion of Jewish teachers, therefore, the object of the "Kol Nidre" in declaring oaths null and void is to give protection from divine punishment in case of violation of the vow. No vow, promise, or oath, however, which concerns another person, a court of justice, or a community is implied in the "Kol Nidre." It must be remembered, moreover, that five geonim were against while only one was in favor of reciting the prayer (Zunz, "G. V." p. 390, note a), and furthermore that even so early an authority as Saadia wished to restrict it to those vows which were extorted from the congregation in the synagogue in times of persecution ("Kol Bo," l.c. ); and he declared explicitly that the "Kol Nidre" gave no absolution from oaths which an individual had taken during the year. 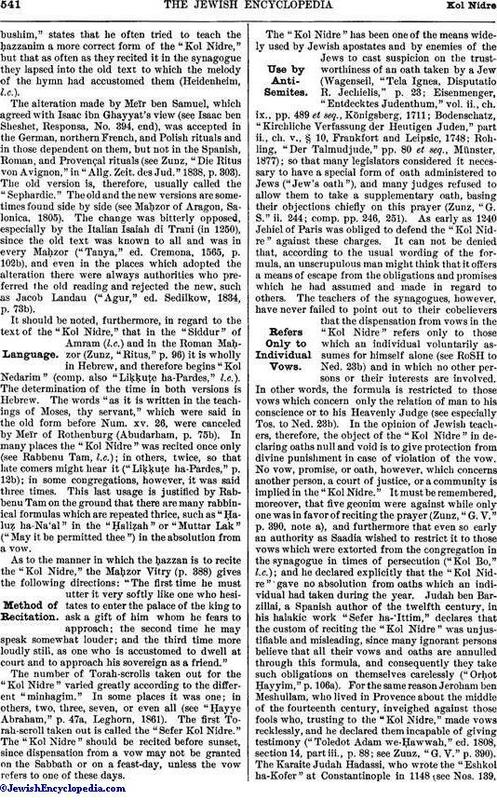 Judah ben Barzillai, a Spanish author of the twelfth century, in his halakic work "Sefer ha-'Ittim," declares that the custom of reciting the "Kol Nidre" was unjustifiable and misleading, since many ignorant persons believe that all their vows and oaths are annulled through this formula, and consequently they take such obligations on themselves carelessly ("Orḥot Ḥayyim," p. 106a). For the same reason Jeroham ben Meshullam, who lived in Provence about the middle of the fourteenth century, inveighed against those fools who, trusting to the "Kol Nidre," made vows recklessly, and he declared them incapable of giving testimony ("Toledot Adam we-Ḥawwah," ed. 1808, section 14, part iii., p. 88; see Zunz, "G. V." p. 390). The Karaite Judah Hadassi, who wrote the "Eshkol ha-Kofer" at Constantinople in 1148 (see Nos. 139,140 of that work), likewise protested against the "Kol Nidre." Among other opponents of it in the Middle Ages were Yom-Ṭob ben Abraham Isbili (d. 1350) in his "Ḥiddushim"; Isaac ben Sheshet, rabbi in Saragossa (d. 1406), Responsa, No. 394 (where is also a reference to the preceding); the author of the "Kol Bo" (15th cent. ); and Leon of Modena (d. 1648 [see N. S. Libowitz, "Leon Modena," p. 33, New York, 1901]). In addition, nearly all printed maḥzorim contain expositions and explanations of the "Kol Nidre" in the restricted sense mentioned above. 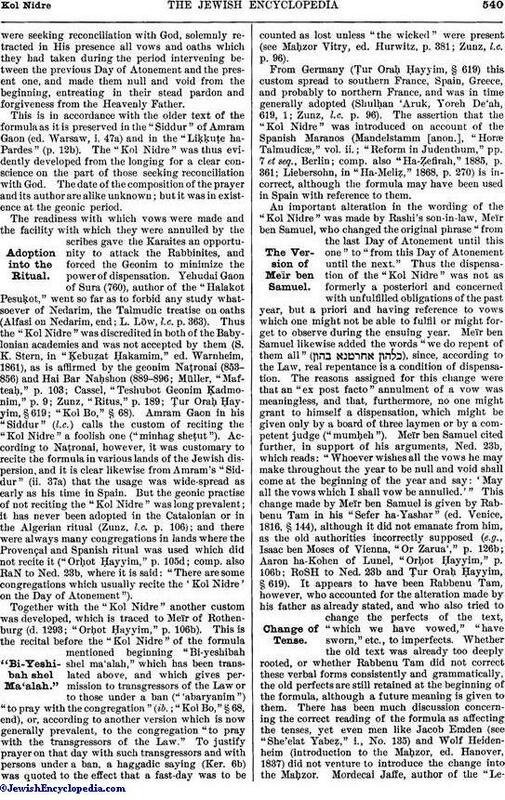 Yielding to the numerous accusations and complaints brought against the "Kol Nidre" in the course of centuries, the rabbinical conference held at Brunswick in 1844 decided unanimously that the formula was not essential, and that the members of the convention should exert their influence toward securing its speedy abolition ("Protocolle der Ersten Rabbiner Versammlung," p. 41, Brunswick, 1844). 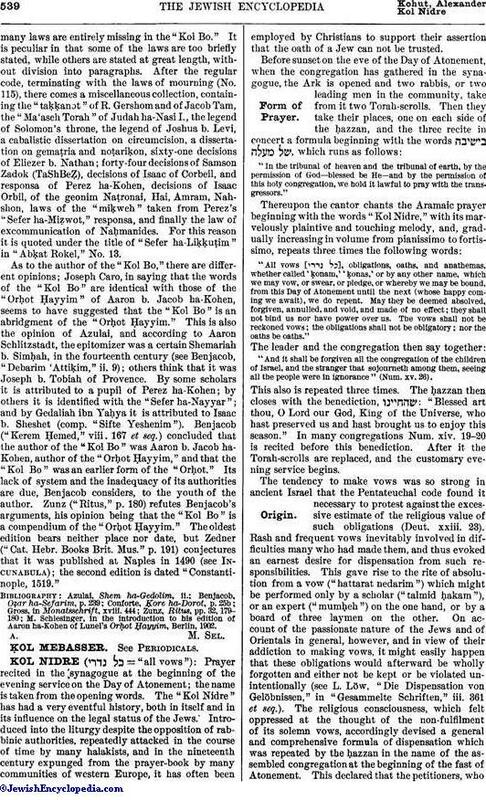 At other times and places during the nineteenth century emphasis was frequently laid upon the fact that "in the 'Kol Nidre' only those vows and obligations are implied which are voluntarily assumed, and which are, so to speak, taken before God, thus being exclusively religious in content; but that those obligations are in no wise included which refer to other persons or to non-religious relations" ("Allg. Zeit. des Jud." 1885, p. 396). The decision of the conference was accepted by many congregations of western Europe and in all the American Reform congregations, which while retaining the melody substituted for the formula a German hymn or a Hebrew psalm, or changed the old text to the words, "May all the vows arise to thee which the sons of Israel vow unto thee, O Lord, . . . that they will return to thee with all their heart, and from this Day of Atonement until the next," etc. Naturally there were many Orthodox opponents of this innovation, among whom M. Lehmann, editor of the "Israelit," was especially prominent (see ib. 1863, Nos. 25, 38). 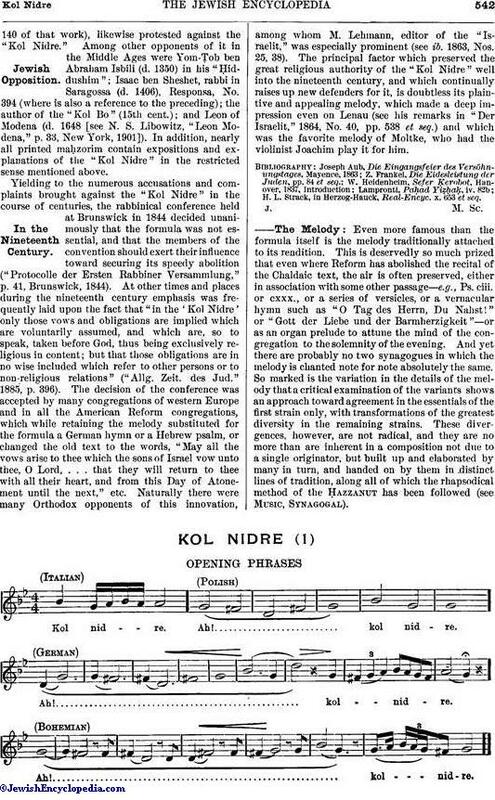 The principal factor which preserved the great religious authority of the "Kol Nidre" well into the nineteenth century, and which continually raises up new defenders for it, is doubtless its plaintive and appealing melody, which made a deep impression even on Lenau (see his remarks in "Der Israelit," 1864, No. 40, pp. 538 et seq.) and which was the favorite melody of Moltke, who had the violinist Joachim play it for him. H. L. Strack, in Herzog-Hauck, Real-Encyc. x. 653 et seq. Even more famous than the formula itself is the melody traditionally attached to its rendition. This is deservedly so much prized that even where Reform has abolished the recital of the Chaldaic text, the air is often preserved, either in association with some other passage—e.g., Ps. ciii. or cxxx., or a series of versicles, or a vernacular hymn such as "O Tag des Herrn, Du Nahst!" or "Gott der Liebe und der Barmherzigkeit"—or as an organ prelude to attune the mind of the congregation to the solemnity of the evening. And yet there are probably no two synagogues in which the melody is chanted note for note absolutely the same. So marked is the variation in the details of the melody that a critical examination of the variants shows an approach toward agreement in the essentials of the first strain only, with transformations of the greatest diversity in the remaining strains. These divergences, however, are not radical, and they are no more than are inherent in a composition not due to a single originator, but built up and elaborated by many in turn, and handed on by them in distinct lines of tradition, along all of which the rhapsodical method of the Ḥazzanut has been followed (see Music, Synagogal). KOL NIDRE (1)OPENING PHRASES Original Elements. 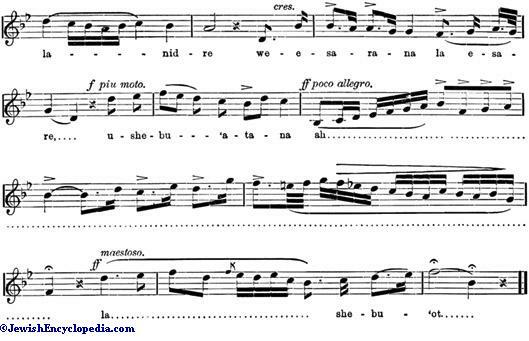 On a critical investigation on comparative lines, the structure of "Kol Nidre" is seen to be built upon a very simple groundwork, the melody being essentially an intermingling of simple cantillation with rich figuration. The very opening of "Kol Nidre" is what the masters of the Catholic plain-song term a "pneuma," or soul breath. Instead of announcing the opening words in a monotone or in any of the familiar declamatory phrases, some ancient ḥazzan of South Germany prefixed a long, sighing tone, falling to a lower note and rising again, as if only sighs and sobs could find utterance before the officiant could bring himself to inaugurate the dread Day of Atonement. Breslaur draws attention to the similarity of these strains with the first five bars of Beethoven's C sharp minor quartet, op. 131, period 6, "adagio quasi un poco andante." An older coincidence shows the original element around which the whole of "Kol Nidre" has been built up. The pneuma given in the Sarum and Ratisbon antiphonaries (or Catholic ritual music-books) as a typical passage in the first Gregorian mode (or the notes in the natural scale running from "d" to "d" ["re" to "re"]), almost exactly outlines the figure which prevails throughout the Hebrew air, in all its variants, and reproduces one favorite strain with still closer agreement. 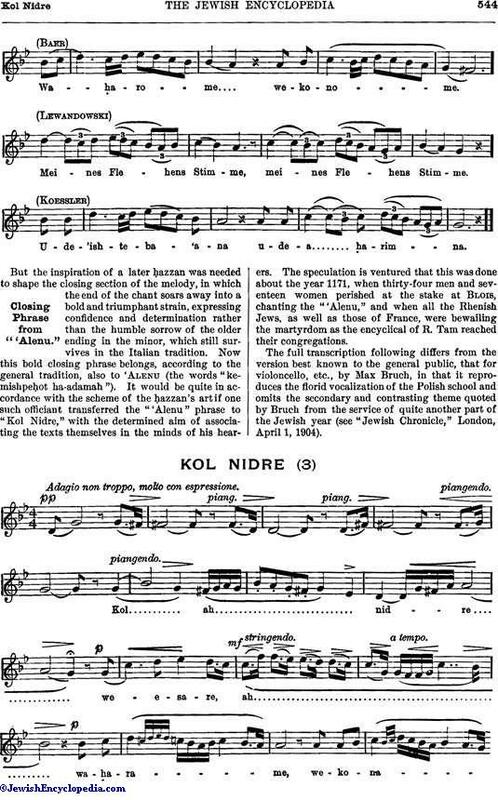 The original pattern of these phrases seems to be the strain of melody so frequently repeated in the modern versions of "Kol Nidre" at the introduction of each clause. Such a pattern phrase, indeed, is, in the less elaborated Italian tradition (Consolo, Nos. 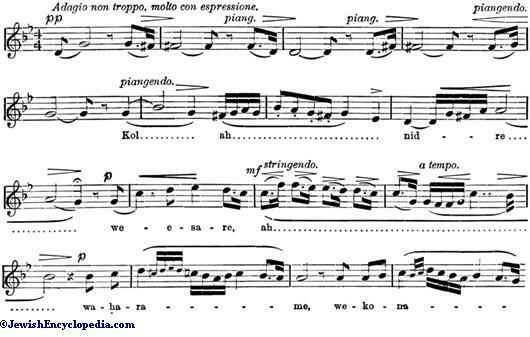 3 and 6 in the following transcription), repeated in its simple form five times consecutively in the first sentence of the text, and a little more elaborately four times in succession from the words "nidrana lo nidre." The northern traditions prefer at such points first to utilize its complement in the second ecclesiastical mode of the Church, which extends below as well as above the fundamental "re." 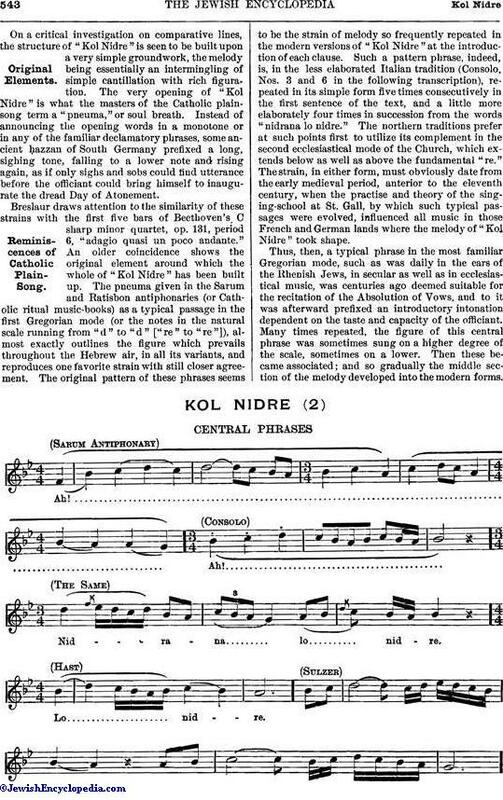 The strain, in either form, must obviously date from the early medieval period, anterior to the eleventh century, when the practise and theory of the singing-school at St. Gall, by which such typical passages were evolved, influenced all music in those French and German lands where the melody of "Kol Nidre" took shape. 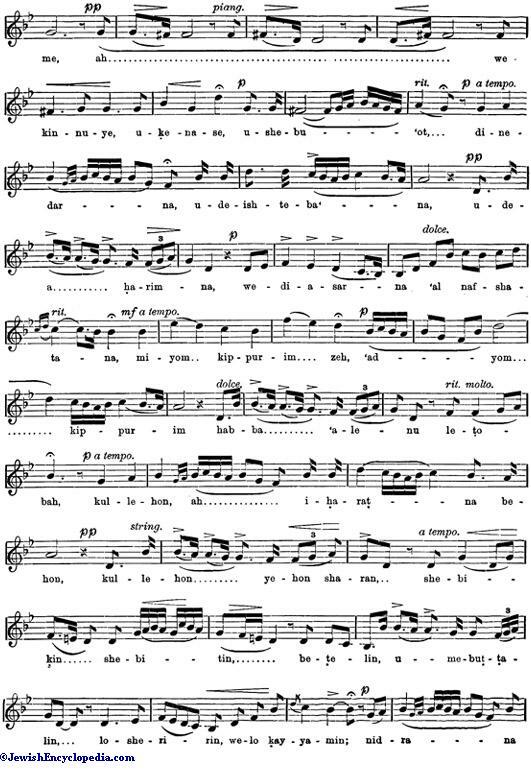 Thus, then, a typical phrase in the most familiar Gregorian mode, such as was daily in the ears of the Rhenish Jews, in secular as well as in ecclesiastical music, was centuries ago deemed suitable for the recitation of the Absolution of Vows, and to it was afterward prefixed an introductory intonation dependent on the taste and capacity of the officiant. Many times repeated, the figure of this central phrase was sometimes sung on a higher degree of the scale, sometimes on a lower. Then these became associated; and so gradually the middle section of the melody developed into the modern forms. KOL NIDRE (2)CENTRAL PHRASES Closing Phrase from "'Alenu." 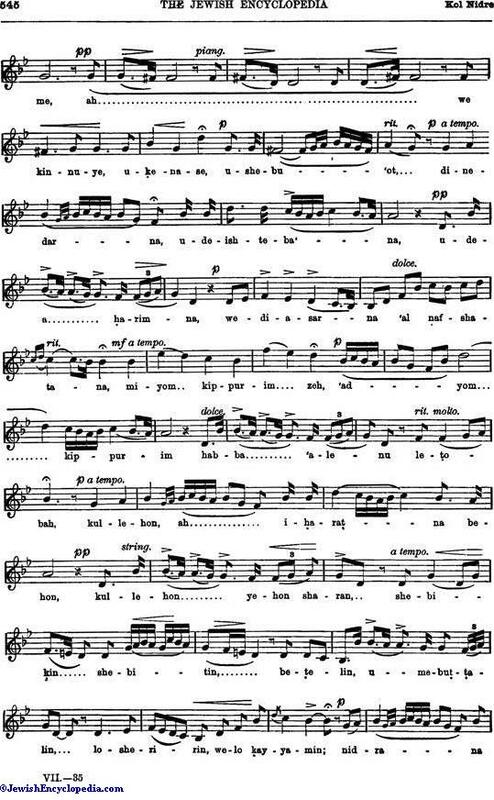 But the inspiration of a later ḥazzan was needed to shape the closing section of the melody, in which the end of the chant soars away into a bold and triumphant strain, expressing confidence and determination rather than the humble sorrow of the older ending in the minor, which still survives in the Italian tradition. Now this bold closing phrase belongs, according to the general tradition, also to 'Alenu (the words "kemishpeḥot ha-adamah"). It would be quite in accordance with the scheme of the ḥazzan's art if one such officiant transferred the "'Alenu" phrase to "Kol Nidre," with the determined aim of associating the texts themselves in the minds of his hearers. The speculation is ventured that this was done about the year 1171, when thirty-four men and seventeen women perished at the stake at Blois, chanting the "'Alenu," and when all the Rhenish Jews, as well as those of France, were bewailing the martyrdom as the encyclical of R. Tam reached their congregations. 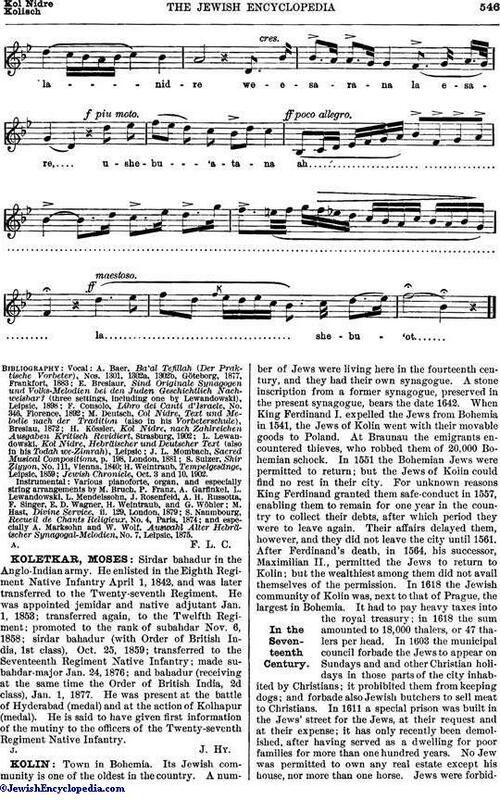 The full transcription following differs from the version best known to the general public, that for violoncello, etc., by Max Bruch, in that it reproduces the florid vocalization of the Polish school and omits the secondary and contrasting theme quoted by Bruch from the service of quite another part of the Jewish year (see "Jewish Chronicle," London, April 1, 1904). Jewish Chronicle, Oct. 3 and 10, 1902.
and especially A. Marksohn and W. Wolf, Auswahl Alter Hebräischer Synagogal-Melodien, No. 7, Leipsic, 1875.